This week's Name Game is brought to you once again from my good friend Patrick! I just got Skyward Sword. Haven't gotten that far in it yet but I love it so far. Patrick brought up the point of how every hero is named Link. 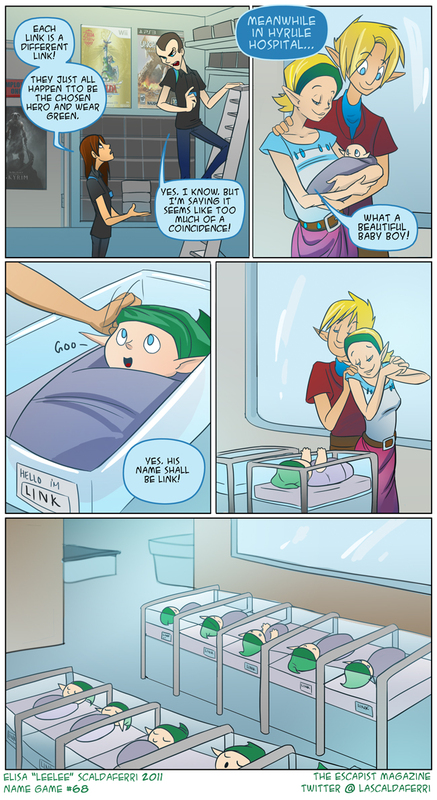 His conclusion: parents of Hyrule aren't very creative when it comes to naming their children. If you have any complaints about continuity or Zelda mythology... find a way to contact him and complain there. On another note I had a BLAST at Desert Bus! My watercolors auctioned off for $1000 which was WAY more than I could have ever asked for. They raised an amazing amount of money for such a great cause. I love the LRR crew and I'm beyond honored to say they're some of my closest friends. I'd be lying if I said I wasn't choked up watching that last hour. Congrats to them!